The Final Acts of RRC-06 contain the Regional Agreement GE06, adopted by RRC-06, which governs the use of frequencies by the broadcasting service and other primary terrestrial services in the frequency bands 174-230 MHz and 470-862 MHz. 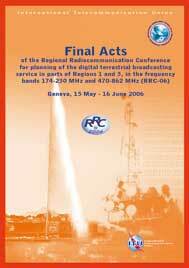 They also contain frequency assignment and frequency allotment plans for the digital broadcasting service (television and sound), the analogue television plan applicable in the transition period, the coordinated list of assignments to other terrestrial primary services in these bands, and the Resolutions adopted by RRC-06. The GE06 Agreement is provisionally applicable as from 17 June 2006. (Note: Only the freely available Table of Contents is downloadable).